Have you noticed how bean curds in so many Chinese restaurants and Indo – Chinese restaurants is spelt as bean cards? Bean curds or tofu is not tasty on its own but spice it up and it becomes a protein rich dish for vegetarians. During my trip to Nairobi recently, I bought some tofu (don’t get it easily in Mombasa). My husband claimed that he would not eat it so I better finish all of it on my own. I love tofu so thought “that’s ok by me as I can easily use it in various forms”. What is tofu? Tofu is like paneer, but not made from a dairy product. Its made from soya beans, water and a curdling agent. 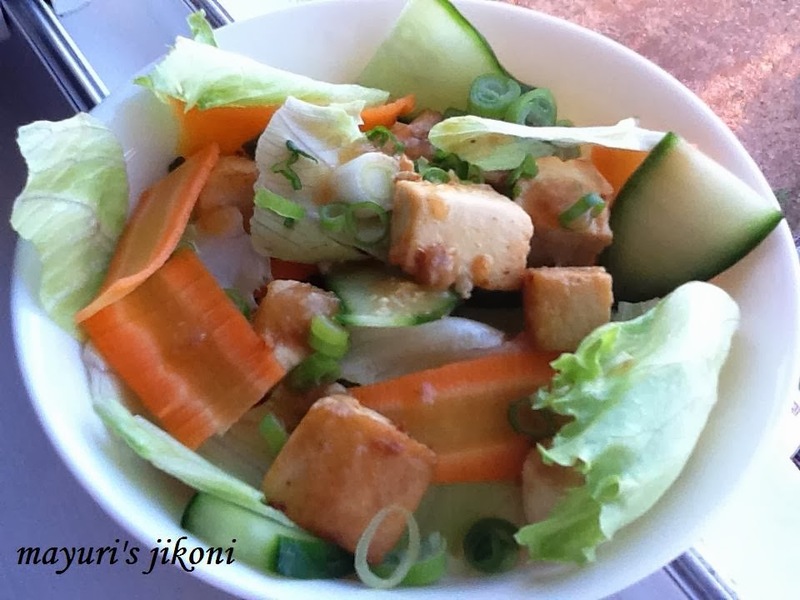 There are two types of tofu available, silken or soft tofu and the regular or firm tofu. Silken tofu is often used in place of dairy products for desserts,dips and smoothies. Tofu has the ability to absorb new flavours and spices through marination or sauces. Tofu is a rich source of protein, calcium and iron. I made some delicious tofu salad, and there is no guessing who picked out most of the tofu. I was left with rest of the ingredients. A simple and nutritious salad, just right as light lunch or just before the main meal. Mix all the ingredients for the dressing in a bowl. Add the tofu cubes and let it marinade for 20 to 30 minutes. Peel the carrot and make thin slices lengthwise. If the carrot is big, cut the slices into half. I used my normal vegetable peeler but you can also use a mandolin. Slice the cucumber lengthwise. I didn’t peel it as the skin was soft. Wash and pat dry the lettuce leaves on a clean kitchen towel. Tear it into pieces. Heat oil in a wide pan over medium heat. Place the tofu in the hot oil and let it cook for 2 to 3 minutes. Turn the tofu over gently. Cook for a further 2 to 3 minutes. Remove the cooked tofu and put it on a plate till it becomes cold. Mix the lettuce leaves, carrot and cucumber slices. Add the tofu and mix. Add in the spring onions and tofu and any remaining dressing. For really fresh crunchy carrot slices, put the slices in ice cold water for 10 to 15 minutes. Add a bit of green chilli paste to the dressing if you like spicy salad. Don’t let the tofu become too brown. Add any lettuce leaves of your choice. If you don;t have any spring onion, add sliced white or red onion. Add other vegetables if you like e.g. celery, red or yellow pepper etc. Delicious and healthy salad, love it. Thanks for sharing with NCR.